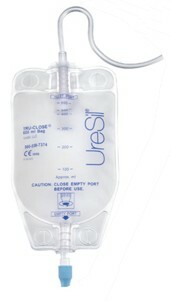 Uresil Tru-Close gravity drainage back, universal, with 24" silicone tubing, anti-reflux valve, twist open port, 600ml capacity and soft and pliable for patient comfort. For nephrostomy, can be worn around waist or leg. Sold by the each.